A ruthless group of Batarians have strapped rocket engines to an asteroid and have redirected its course, intent on wiping out a human colony and making a statement to the Citadel Council about the Batarian's role in the galaxy. But the Batarians didn't count on Commander Shepard and company intervening. Perhaps the most well-rounded sidequest mission in Mass Effect, the Bring Down the Sky DLC is short, sweet, and to-the-point. Shepard's team will traverse the surface of the asteroid in the Mako, stopping at each engine control station to take out the rogue Batarian troops and stop the propulsion. There are a few dialogue option sequences, wherein Shepard can convince one of the Batarian squad leaders to leave without a fight and initiate a secondary quest search for the remaining scientists stationed on the asteroid prior to the Batarian takeover. Most of this DLC requires a traditional combat approach, though one portion requires Shepard to carefully navigate through a mine field on foot. The experience isn't substantial enough to make it as memorable as any of the main story missions, but it's still enjoyable for what it's worth. The dialogue between Shepard, the science team, and the Batarian leader is well-scripted, considering the mission takes less than an hour to complete, and it's nice to see BioWare expanding their universe just a bit more through the inclusion of this new alien race. If you find yourself bored with the limited exploration on the default uncharted worlds of the main game, this more linear DLC may prove a satisfying (if not brief) distraction. Mass Effect is effectively the natural evolution of Bioware's former bestselling and critically-acclaimed Star Wars title, Knights of the Old Republic. The core of Mass Effect's gameplay should feel familiar to KotOR veterans, but this is more than a simple rehash. Indeed, the Mass Effect galaxy is filled with many species of aliens, and the purpose of the Citadel echoes the likes of KotOR's hubworld Taris, but what may initially seem a love letter to KotOR fans becomes a brand new science fiction epic set in its own wonderfully-realized universe. Humanity is one of many species that now operates as part of the Citadel, a giant artificial station believed to have been constructed by the long-extinct but hyper-advanced race known as the Protheans. With a recent push for further human representation in the Citadel Council, Commander Shepard has been tasked with seeking out an artifact on the planet Eden Prime, with a Council representative looking to observe and evaluate Shepard as a potential candidate for the Spectres - a group of independent and powerful agents that can operate above and beyond normal police or military restrictions. As Shepard and company quickly discover, Eden Prime has come under attack by the synthetic armies of the Geth, who have not traveled beyond their own system in two centuries. 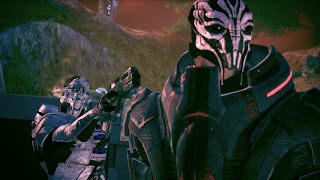 Leading the Geth's charge is Saren, a rogue Turian Spectre who believes humans are too great of a threat to the galaxy. 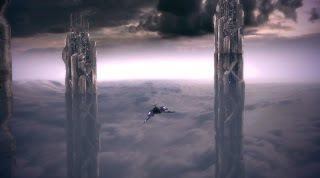 After locating the artifact, Shepard has a vision of impending destruction, and the race is on to discover what Saren's ultimate plan is. Building your character from a few different classes and backstories determines how the game will play out for you. Whether Commander Shepard was born into a military family or grew up on a colonial world doesn't limit the ultimate outcome of his/her story, but it does hold slight influence over the manner in which NPCs approach and converse with the protagonist early on. Of greater influence is personal play style. Aside from the traditional gun-toting soldier, there are Biotics and a tech-oriented class geared more toward a support role. Biotic characters act similar to force-adepts from Star Wars, as they can erect barriers, temporarily freeze enemies, and even fling objects/people short distances through the air. Three combination classes exist, each that balances two of the aforementioned classes, providing greater adaptability on the go while also limiting the weapons and special training available to Commander Shepard. Shepard's decisions in handling major plot points, sidequests, and even minor dialogue sections will influence how NPCs perceive the lead character. Decisions perceived as 'good' will build Shepard's Paragon meter and will make him/her more well-liked by the various species of the Citadel. Conversely, decisions perceived as 'bad' will give Shepard Renegade points and a reputation as ruthless and violent. As such, inhabitants of the Citadel will be more inclined to view him/her as a dangerous and aggressive human who is more interested in advancing humanity's influence over the galaxy than working cooperatively with races like the Turians, Salarians, Asari, and so on. While the Paragon/Renegade meters are similar to the Force Alignment meter from KotOR, it is possible to build both meters simultaneously, and the two need not compete to balance with one another. Shepard's alien comrades are arguably more interesting and better developed than the default human comrades. While humans Kaidan and Ashley have a history of Biotic training and an upbringing in a military family respectively, their stories don't ever seem to flesh out in as colorful or interesting a manner as the rest. Asari scientist Liara seeks to understand Prothean culture, but comes to better understand human behavior during her time aboard the Normandy. She is a powerful Biotic, and though her ability in wielding weapons is severely limited, she can wreak havoc on enemies with abilities like Throw and Warp. Wrex is a 'shoot first, ask questions later' kind of guy, and his hulking Krogan figure allows him to act as a tank character. 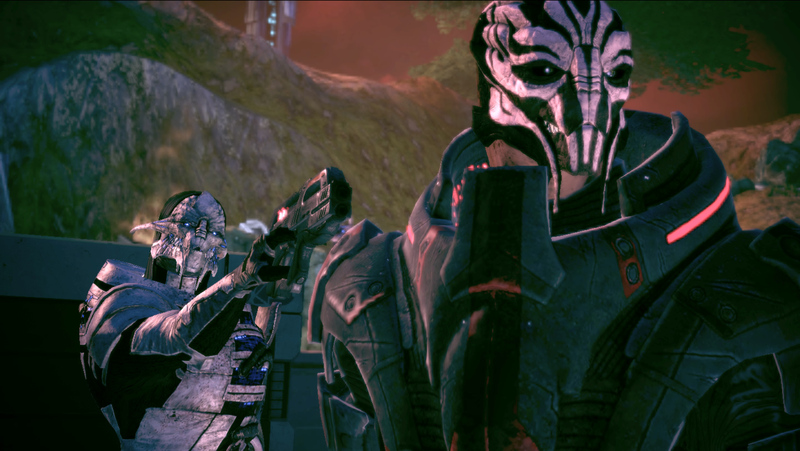 Garrus is more of a typical soldier, able to wield assault rifles and snipers, and his past history with the Citadel police force known as C-Sec provides Shepard with plenty of useful info regarding the behavior of different species and organizations. Tali is a tech expert, but can still be trained to handle pistols and shotguns well, making her something of a middle ground between a support character and a close-quarters combatant. 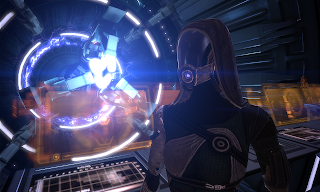 On her pilgrimage from the Quarian artificial homeworld known as the Flotilla, Tali is as eager to learn about the greater galaxy as she is to provide Shepard with info on the Geth and show the rest of the crew what she knows about ship tech. 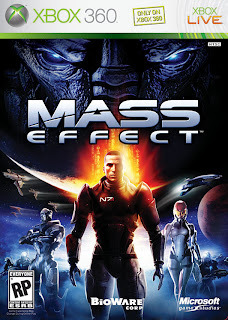 Each character's dialogue is intelligently written, and adds an extra degree of complexity and believability to their presentation, from Wrex's grudge against the Citadel's decision to unleash a genophage that limited the Krogan population, to Garrus' dissatisfaction with the limitations he faced as C-Sec, to Normandy pilot Joker's pride in his ability to handle the fastest ship in the galaxy despite his brittle bone disease. The story is focused primarily on stopping Saren and the Geth, but conversations and lore make the world seem much larger. Even though Shepard is unable to visit the homeworlds of the Asari or the Quarians, their cultures still pop up as points of discussion frequently enough to offer a concrete idea of how non-human races operate both on their own and as part of the Citadel collective. 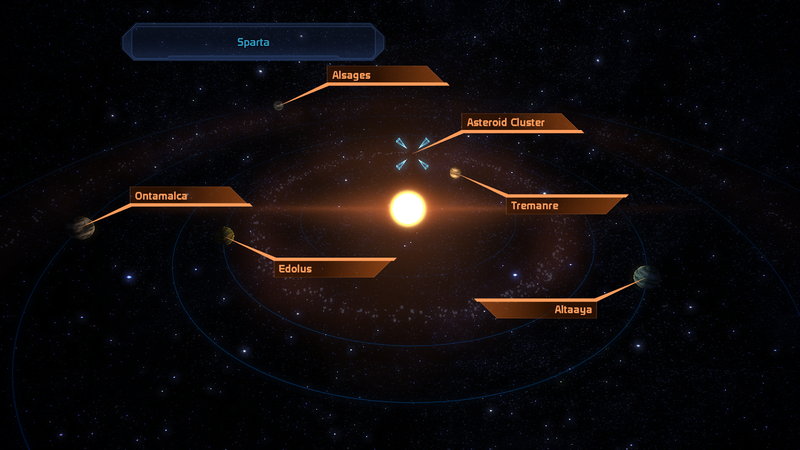 Most sectors of the galaxy are host to multiple systems, and each system is host to one planet that Shepard and company can land on and explore. Others can be scanned for resources or lore. Sometimes Shepard will merely discover further resources or Prothean artifacts, other times he/she will have an encounter with another group, whether they are mercenaries, biotic cultists, or the insectoid Rachni. 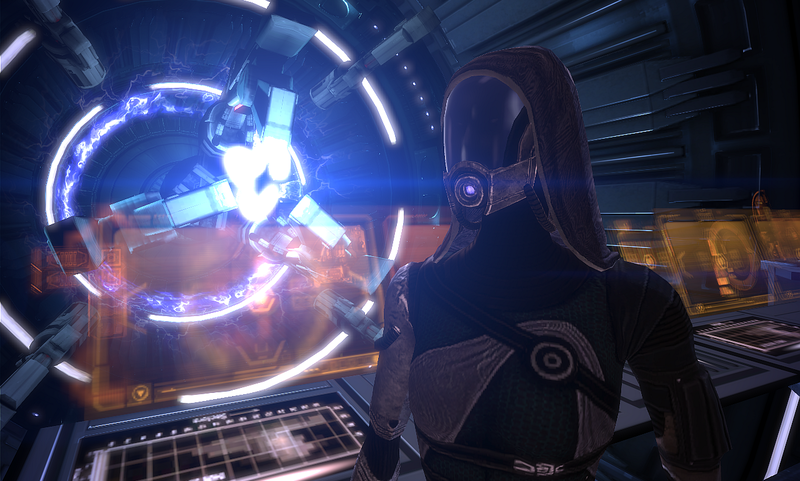 While scans will provide Shepard with a glimpse at events in the Milky Way, asking the game's many characters about their own history or knowledge of how different groups operate will paint the larger picture bit by bit, and all this can be referenced later on through Shepard's codex via the pause menu. A handful of major missions makes up the core of the game, each of which is more fully realized though far more linear than Shepard's excursions to uncharted worlds, and some include major decisions which will alter the way that the remainder of your playthrough of Mass Effect (as well as events in the sequel games) pans out. The majority of sidequests are accessible through the Citadel, though the layouts of some bases are recycled in more combat-heavy sidequests. The game utilizes a simple but solid cover system, requiring players to simple press into a pillar or crouch behind a short wall to be able to fire over it, then retract to better cover themselves once more. However, improving shield power and physical endurance as your party levels up can make open firefights a more viable option. The enemy AI is quite intelligent, whether they divide their forces between holding covered positions and pushing forth toward Shepard's crew in confined areas, or spread out to try and flank the Mako at one of their outposts. 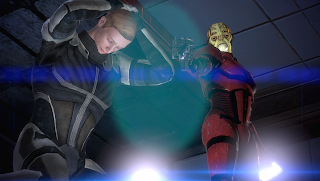 Party members can be directed to charge foes, take cover, or fall back to Shepard's side, though they will occasionally block the immediate field of vision by standing in front of said hero/heroine. While the majority of combat will be spent taking down Geth, their designs are nicely varied. The standard body sizes include soldiers, snipers, and shock troopers, while small agile Geth attempt to overwhelm Shepard's team with speed, agility, and little in the way of defensive measures. Larger Geth range from tall and bulky bipedal designs to giant quadrupedal units that behave more or less as mobile turrets, the latter of which usually seek to stop any advances Shepard's team attempts to make in the Mako through Geth-controlled territory. If there is one element that falls significantly short of the quality players should come to expect from the rest of the game, it is how the Mako controls. The Mako is dropped from the Normandy nearly each and every time Shepard's team visits a new planet, and is used to traverse tough terrain. However, it bounces all over the place and turns in a manner that feels very unnatural. After a few excursions, it may seem slightly less annoying, but it never handles as smoothly as the likes of the Warthog from the Halo series. Weapon upgrades are rather basic, and provide firearms with better stability, slower rate of overheating, etc. The same goes for the defensive upgrades that can be attributed to armor and the tech upgrades exclusive to Biotic characters. Reverting unwanted items to Omni-gel is somewhat useful early on, but becomes borderline-pointless once Shepard is leveled up a decent amount. To that end, it feels like Bioware could have made the process of breaking down weapons and items more complex - i.e. salvaging them for specific part upgrades. Override sequences are essentially Simon-style fast-paced button prompts, and quickly become second nature. The game's soundtrack is not particularly outstanding, but as a whole, it is quite evenly divided between tracks that match the element of exploration and tracks that perpetuate a sense of adventure and action. As Mass Effect is an older Xbox 360 title, graphics have a tendency to 'bump-in' at times, usually when a cutscene is prompted. That said, the game looks gorgeous for the day of its release - the Citadel is pristine and brightly-lit while character models are full of emotion.